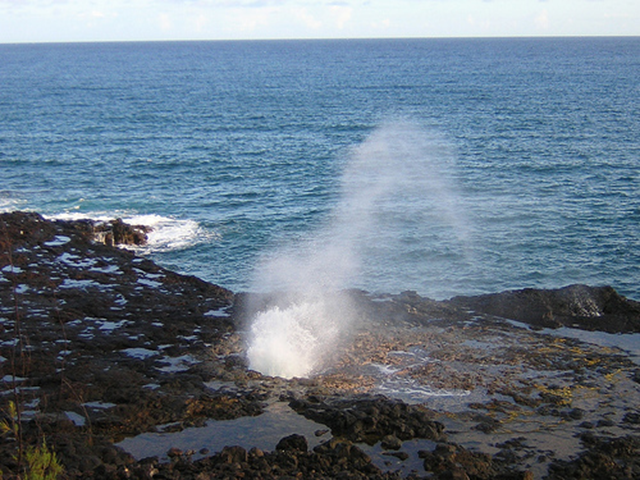 In the Poipu area of Kauai, you will find an impressive blowhole called Spouting Horn. A blowhole forms at the end of a lava tube and as waves crash in, water goes into the tube and it builds up pressure to blow the water back out. The spouts of water can reach up to 50 feet high. Not only does the blowhole create an impressive display, but it also makes interesting sound effects as well. Ancient Hawaiians believed this coastline was once guarded by a giant moo (lizard). Everyone was afraid of the moo because it would eat anyone who tried to fish or swim in the area. One day a man named Liko entered the ocean. The moo went to attack him but Liko quickly swam under the lava shelf and escaped through a small hole to the surface. The large moo followed him and got himself stuck in the lava tube. To this day, you can hear the lizard’s groan and see his breath spraying from the hole. To find Spouting Horn on a Google Map, click here. It’s easy to find and access. Just came back from a Kauai vacation. So many things have changed from my growing up years. Still love it tho’! Thanks for stopping by and commenting, bjandpapu! I love Kauai, too! If I was forced to choose a favorite, Kauai might be it. What seems to have changed the most in Kauai? My wife and I are from Sydney Australia and I have found this page very helpful . We are travelling to Hawaii and will be visiting Kauai for just 1 day. This has helped me set an itinerary which I hope will impress my wife as this is a surprise day for her. Ill let you know how it goes when we get back. We are travelling in late July 2011.